Home Bus and Coach Oh, La La! France celebrated World Cup win on an UNVI bus! 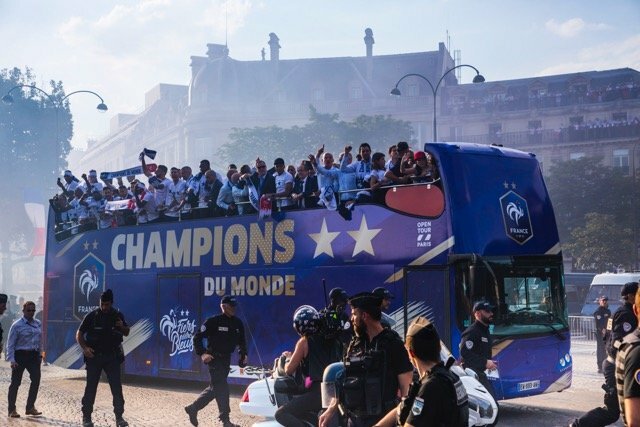 France team players, winners of the recently concluded Football World Cup in Russia, travelled on the celebratory tour along the Champs-Elysées in Paris on a 100% electric Double Decker Open Top bus manufactured by UNVI, headquartered in Ourense (Spain). “It is becoming increasingly common to see our buses in this kind of celebrations. As an example, we have seen one on the 13th European Champions Cup win celebration by Real Madrid this year, and back in 2006 to when Italy won their 4th World Cup. But this is the first time it is done on a 100% electric bus,” stated Zeltia Ferro Pérez, UNVI spokesperson.